In February we will be privileged to present a Photo Montage set to a song the Bopulaters will be releasing then. We shall bring you details on how to purchase this as soon as it’s available. The Bopulaters play Avalon Bowlo this afternoon 3-6pm. I was raised in a home with a pianola in the living room and a father old enough to be my grandfather. His taste for hits from the 1920’s & 30’s eg: “Swanee (how I love ya etc), Al Jolson, “The Charleston”, “Darktown strutters Ball” and Hogie Carmichael songs eg: “Stardust”, are surely etched into my psyche. Some of these rolls were treasured possessions, which ironically, copped most of the wear and tear (literally) especially during enthusiastic sing alongs which happened just about every weekend. The ‘Cross hands boogie” was my favourite as a child, no singing in that one, all my attention on the rapidity of the rise and fall of the keys. At the age of 6 or 7 a family of newcomers bought our old house in Avalon sometime after we had moved up the road to our sandstone castle my father built. This family played a variety of instruments from tea chest bass to trumpet and inspired me to get serious about the ukulele. To begin, my one armed father (right arm lost in a car accident) would play chords and sing while I strummed. He told me I had harmonised whilst attempting to sing along with him. He was delighted to discover I could do this instinctively. The uke led to the tenor banjo then to the guitar, dabbling in blues harmonica along the way. My older surfing mates, Brian Barriskill and Glenn Short amazed me with what they could do on those tiny instruments. Then I heard Taj Mahal, he became my idol probably for the next several years. 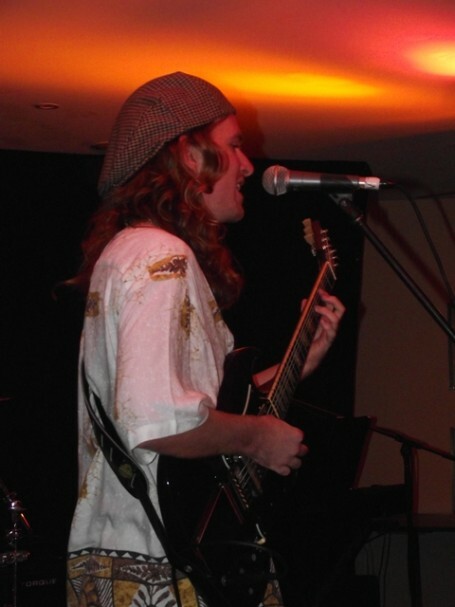 I participated regularly in high school end of year concerts and formed a musical friendship with the late Ian (Nai) Stevens, a fellow Pittwater High student and accomplished folk/rock guitarist; he taught me a lot. Many a Friday night would be spent with another school mate Neil Bryant playing and singing CSN&Y (Crosby, Stills, Nash and Young) trying to emulate their vocal harmonies. In my late teens I injured a finger of my left hand in a surfing accident, leaving me unable to play chords on the guitar. It was then the piano became attractive for a while but I returned to the guitar when movement returned. Shortly after this period the formation of the Bilgola Bop Band began. consisting Barrenjoey High School kids, Steve Brien & Mat Wenban and two older guys, one a local psychologist/surfer Chuck Davis, the other an established rock bassist Peter Barron from local band Tamam Shud. Many of the local musicians were drawn together by chance when they played for the Friday night community coffee shop organised for young people in the old Avalon Community Hall. The Bilgola Surf Club gigs soon followed fortnightly, sometimes weekly (depending on other engagements) these gigs carried on for 2 years providing a vibrant meeting place for the young locals to let off steam. Admission was $1. The bands we idolised we imitated (Doobies, Taj Mahal, Doors etc). We played several originals as well, some mine ,the others Steve’s all of which we performed as support act for American recording artist JJ Cale in 1976. BBB continued for a few more years with a few line up changes, then disbanded May’78 when Steve and Mat discovered Jazz. I played with various local muso’s during the ensuing years but mainly with Chuck Davis and Milton Brown in a band called Lion Idol in a Wednesday night residency at Moby’s in early 80’s.. Music was never my principle form of income. This is when I bought my first 4 track tape recorder which opened the door to songwriting. This became hobby for about 2 decades creating a stockpile of hundreds of ideas on cassettes tapes, some promising, most to be forgotten. As one of my early jazz teachers said “it takes at least 10 years trying before you write a good song”. With the advent of the home PC the songwriting process changed forever. The ease with which you can put together a complete song is mind bogling. All the preliminary ground work on sequences and the old four track had put me in good stead for creating music on the computer. I found I could create all the parts to form complete arrangements for a four piece rock band with little effort. The lyrics being the hard part. The singing? Well the process also teaches you to sing in a way, because you become your own biggest critic. Once on a CD or MP3 file you can send the complete song to the band members and they learn it, making rehearsals a breeze. That’s if the band members are willing…. From about 15 years ago to about 1 year ago BBB would reunite for gigs usually at the PBGC maybe 2 or 3 times a year. Playing the old 70’s covers would provide a nostalgic night of entertainment where the prospect of seeing all the old faces was just as bigger draw card as the thrill of witnessing a Steve Brien guitar solo. But a vehicle for my original songs, alas, BBB was not to be. Disparities in addresses alone, being enough to restrict regular rehearsals. So the Bopulaters conception was essential if my songs were ever going to take the next step out of the drawer and onto the stage. In the late 90’s I befriended a bloke at the local dog park who, it was revealed, lived on an adjacent block to mine in Clareville. Interests in music and antique furniture we had in common. Paul Wheeler (ex Billy Thorpe & the Aztecs) was into creating music but not public performance, not at that stage anyway. Only after he agreed to be apart of an impromptu one off gig at my place in June 2010 did he succumb to the allure of playing gigs again. Finding the guitarist was easy. Ivor lives across the road from me and came to me for guitar lessons about 10 years ago. I soon had to pass him onto a more advanced teacher who he stayed with for several years. He had recently disbanded from the Mad Dog Blues Band and was keen to come aboard enticed by the funky nature of the original repertoire. The three of us live within a 100 yards of each other, and the drummer is not far away. 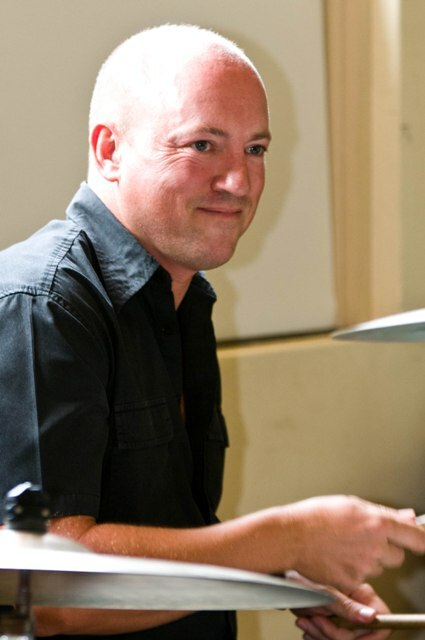 Simon is a professional drummer playing in various Sydney bands and we found him on the net and has slotted in perfectly, happy to rehearse on a weekly basis, making it easy to hone a tight, funky sound. As we introduce new originals to the repertoire we can run them up the flag pole at the local club to see how they fly. What is your favourite song or album? First Album you bought with your own pocket money ? Being the youngest of 3 there was no pressing need to buy anything but "I've been everywhere man" was the first single I bought. What is your favourite place in Pittwater and why ? North Palm Beach for it's unspoiled beauty and occasional surf. What is your 'motto for life' or a favourite phrase you try to live by ? My father always told me "If you don't expect anything from anybody, then you won't be disappointed if you don't get it." Born in Greater London in '47. Moved to Royston just outside Cambridge '58 . Emigrated to Australia in '61 and settled at Queenscliff . Started playing around '63 and eventually got into a band with Jimmy Kelly, Tony Bolton and Gino Cunico about 66. This was the watershed band really, we all went on. Jimmy to S.C.R.A (Southern Contemporary Rock Assemble) after The Affair, Tony to country radio with Greg Quill, Gino to The Executives and eventually song writing in the States. I joined Thorpie at the Whiskey Au Go-go and we ended up in Melbourne in '68 and I stayed there for about 6 years. After Napoleon I played with McKenzie Theory, The Phil Manning band, Savannah Silver Band and then I came up to Sydney and started playing in a studio called United Sound for 3 or 4 years . I hooked up with a couple of guys whose album I'd played on which eventually turned into a duo called Clean Cut with Chris Venn . After which I stopped playing for 3 years until '94 when Billy came back (from USA) and the whole thing started again. I went around with Billy on and off and played with Ian Moss for a year or so. After a period playing around with computers and music, started playing with Jonty and eventually "The Bopulaters" appeared with Simon and Ivor . I don’t have a favourite album there are just so many great ones; Rubber Soul, Abbey Road, Talking Book, Aja, The Band, Blond on Blond and a gazillion others. I started buying when you bought singles and the first 2 I bought together where Mailman Bring Me No More Blues by Buddy Holly and Baby Elephant walk by The John Barry Seven. I'm pretty partial to the Avalon pool and there is a great cave just of the end of one of the trails in Kuringai national park. Motto???? The only thing you can always do better than everyone else is to be YOURSELF. Been a pro drummer for the last 13 years or so. Mostly self taught but studied music at The University of Aberdeen in Scotland. Have played in many groups both here and overseas including tribute acts such as Virtual Floyd, The Australian Blues Bros Show and Hotel California. Also played in musical productions such as Godspell and We Will Rock You. Played on many recordings from singer songwriters to bands and record labels. Currently working as a freelance drummer and drum tutor here in Avalon. It changes depending on my mood but I really like Steely Dan and one of my favourite tracks is Gaucho. The drummer playing on that track is Jeff Porcaro, he played on many sessions in the 80's and has a style that I love. He would be one of my biggest influences. I think it was NOW 2 which is a compilation album with all the latest hits. Would probably be worth something now. My favourite place has to be Avalon Ocean pool, I go down there most days and love to have a run on the beach and dip in the pool. Also love walking around Angophora reserve. Pretty simple really be nice to each other, share the wealth. Be passionate about what you do or don't bother. HSC (Score of 91 in music). A working musician who has been teaching for 3 years. 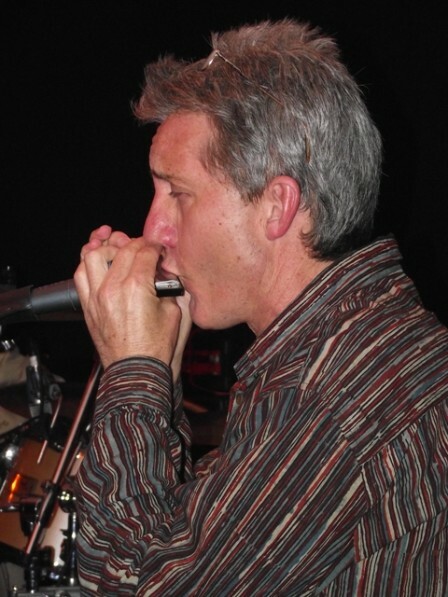 Creator of Northern Beaches blues trio Mad Dog, now disbanded. Was also a member of Michael Vaiasinni’s Mafia, a soul and jazz group. Currently in a funk/r&b band called the Bopulaters containing former members of Billy Thorpe and the Aztecs and the Bilgola Bop Band. Musical influences are many and varied. I suppose I take most influences from black music, from 20's delta blues right through to funk from the 70's and 80's, with all things in between like soul, R&B, reggae, rock'n'roll etc etc. Some of my biggest influences guitar wise were Johnny Winter and Freddie King but I also love Jeff Beck, Peter Green, Santana, the list goes on. I also love songwriters, I take a lot of inspiration from guys like Stevie Wonder, Bill Withers, Taj Mahal. again the list goes on, there are just too many people to name. Of course your teachers have a huge influence on you as well, so both my guitar teachers, Jonty Erwin and Peter Hunt and my drum teacher Matt Wenban have had a big influence as to how I play. I'm pretty sure the first album I bought with my own money would have been AC/DC's TNT. AC/DC was the the first band that got me to pick up an instrument so I'll always have a soft spot for them. My favourite place in Pittwater would have to be Kiddies Corner at Palm Beach. Before I started playing music surfing was my life and that's the spot I learnt. I'm pretty easy going, so if I had to pick a phrase it would be live and let live. Kiddies Corner, Palm Beach (south). 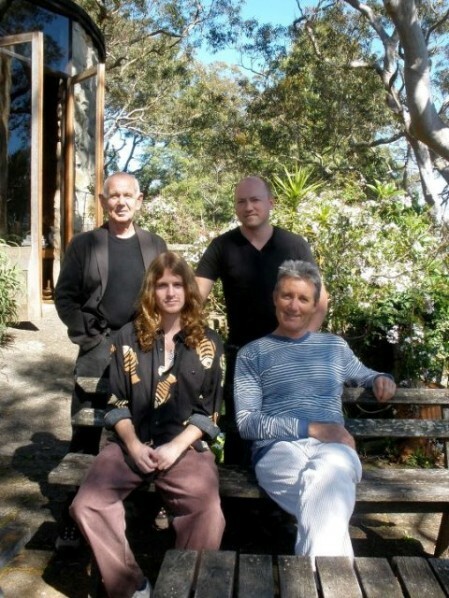 Above, left to right: (back) Paul Wheeler and Simon Abbott, (front) Ivor Simpson-Kennedy and Jonty Erwin. So far they are all 3-6 but may change to 2-4 in Winter. Styles: Rock, Blues, Soul, Funk, Jazz, Latin etc etc.